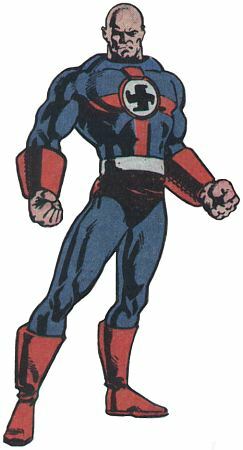 Enhanced Abilities: Ubermensch has super human strength and endurance. Body Armour: Ubermensch skin is capable of deflecting small arms fire. Leaping: Ubermensch is able to leap tall buildings with a single bound. Super Speed: Ubermensch is able to move at super speeds. Ubermensch is the epitome of Adolf Hitler’s ideal of racial purity, selected by Nazi scientists to undergo painful treatments that transformed him into the ultimate Aryan super hero. He became a member of Axis Amerika a team of costumed agents who engaged in subversive activities in the United States during World War II on behalf of the Axis powers.